Pop quiz: What is a brand? Don’t worry; you’re not being marked out of 10! The fact is that ‘brand’ often means different things to different people. Most people, when asked, will say that a company’s ‘brand’ is its logo. Well done if you got that, it’s definitely part of it. In the Cambridge English Dictionary a brand is “a type of product made by a particular company” and again, that is true. Not bad Wiki, not bad! Well, you’ve probably heard the acronym USP, which stands for ‘Unique Selling Point’. Business owners tend to have a really hard time defining their USP. Often they’ll say things like “our USP is the quality of our products” or “our USP is that we really care about customers”…is that really unique? Surely the majority of businesses offer quality products and good customer care? That’s how they stay in business! It’s a pretty good conversation starter right? People are bound to ask you to explain and that’s when you can start to set yourself apart from the crowd. You see it’s vital that you create a unique brand that tells your story. 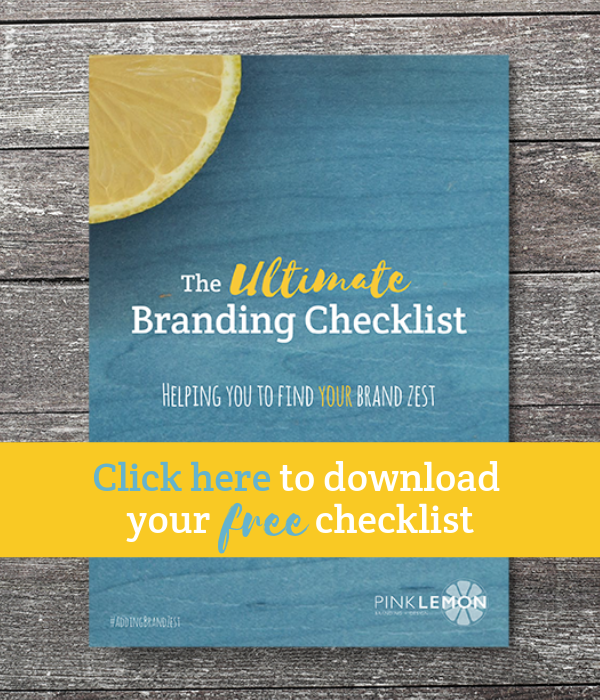 It’s vital that every aspect of your business is consistent and ‘on brand’, and it’s vital that you have a solid brand strategy in place if you want to grow your business. Consider the following questions and jot down some answers, then ask colleagues, family or friends to answer those same questions. Is your company’s ‘style’ obvious to others? Are you putting out a clear message about who you are? If you’re a start-up, try going through your answers with friends and ask them if they have any ideas or input on what you’ve written and maybe even create a Pinterest board as a visual reminder of your goals. Think about your audience. Who are they? What’s their age, location, likes, dislikes etc. Why do they need your product or service? What problem do they have that you can fix? What products do they already use? What sort of imagery or language do they respond to? “At Pink Lemon we work to increase the efficiency of our client’s communications by designing engaging, compelling and innovative graphic and marketing solutions. I may be slightly biased, but come on – it’s pretty good! What do you like/dislike about your competition? what are their strengths? what are they not doing? There’s nothing wrong familiarising yourself with other people’s brands and, if you see a gap in the market then you can build that into your strategy. How are you different from your competition? How are you similar? You may even find that there are opportunities for collaboration. Create a story that’s deep and meaningful and that will resonate with your audience. If you have a strong ‘why’ you can build trust and loyalty. (I’ll be coming back to this in a future blog). Remember when I said that the logo was part of your brand? The emphasis was on the word ‘part’ – you need to think beyond a logo in order to develop your branding. Consider colours, fonts, images, straplines, language, even your behaviour: branding is so much more than just a golden M or a swooshy tick! This is a subject all on its own and I’ll be writing about that in the future, but the important thing right now is to consider your business as a whole, not just as a product of your logo. Pretty much ‘anywhere you go, so does your brand’. Your brand personality should follow your business unfailingly. For example, if your brand personality is corporate and serious, then don’t start posting silly memes on your company’s Instagram account. If your brand is aimed at teenagers then to suddenly start using a load of technical jargon in your marketing would be incongruous. The key word is consistency. Develop a strong social media presence to deliver your brand message. Craft your message through different media but, again, keep everything consistent (again, a blog subject on its own but worth chatting up a professional social media marketer). Use strong imagery that sits in-line with your brand. A picture speaks a thousand words after all, and strong (good quality) imagery is vital. Speak to a professional designer, consider investing in some decent stock images and for goodness sake, don’t create any of your posters in Word for Windows! (Don’t laugh, I’ve seen it happen!). Visibility is the key to success. Your brand should be constantly visible so customers are reminded of who you are, what you do, and what you stand for. This requires a strong, easily recognisable visual style, a good level of our old favourite – consistency – and a solid marketing strategy. Building your brand and raising its profile is something that never stops and it should be included in all your long-term business planning. If you follow the steps above and get some help from experienced professionals, you’ll be well on your way to creating a strong brand, but at the end of the day, you are your own brand’s biggest advocate and it’s your job to ensure that you, your staff and your advocates are familiar with and loyal to, your message. A strong brand yields strong results: it’s a simple premise but a long term process and one that, if you adhere to it, will afford you business growth beyond your wildest dreams!